Nadeo made some incredible tracks in the stock collection that came with TrackMania Nations ESWC. Back in 2006, this game ripped me away from two other brand new ones a bunch of the Friday Night Gamers purchased shortly before we were introduced to it... "Age of Empires III" and "MX vs ATV Unleashed". 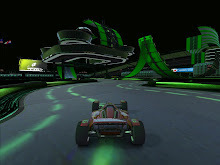 There were several different styles of tracks, including one of my favorites, named "Obstacle" in the game's successor, TrackMania United. This particular track, I-3 has you take a quick left 90-degree turn into some turbos that launch you up a straight ramp which ends abruptly in another piece of track directly above it. Nadeo wants you to go left or right as you launch into the air and continue making more similar jumps to escalate higher and higher until the final short transition jumps to where the finish line is. I'm pretty stoked, and don't know if I could do it again, but there are actually others that have done it even faster. Check out their replays at TMX. Did I mention I love this game?!!? !